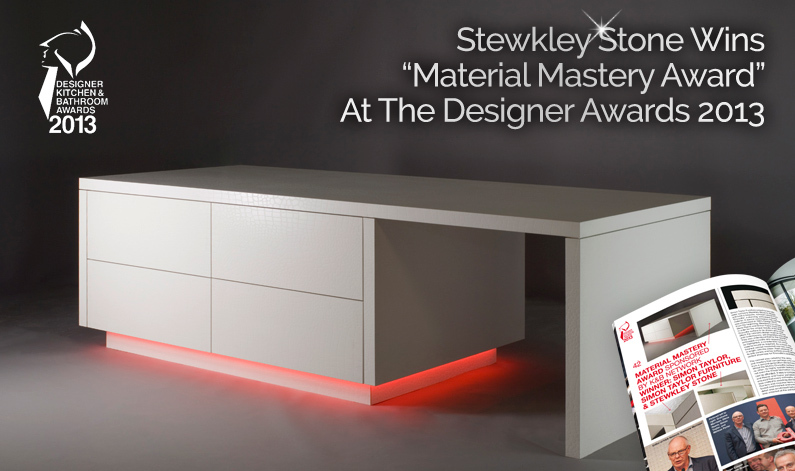 Simon Taylor Furniture and its sister company, Stewkley Stone, have scooped a coveted industry award – the Designer Kitchen & Bathroom Magazine’s ‘Material Mastery Award’. The prestigious event was supported by over 30 of the combined sectors leading brands and was presented by television personality Melissa Porter – best known for her BBC programmes ‘To Buy or Not to Buy’ and ‘Escape to the Country’. The award recognises highly skilled craftsmanship and was awarded to the two businesses for their work with Caesarstone’s stunning ‘Motivo’ quartz in Crocodile. From the beginning of the project, Stewkley’s co-owner and master stone mason, Steven Reeves and Simon Taylor, founder of Simon Taylor Furniture, knew that in order for the unique beauty of the Motivo Crocodile surface to be shown off to best effect, the cabinet’s design must be simple and contemporary, yet perfectly executed. They also understood that for the quartz’s unique ‘crocodile skin’ appearance to be highlighted, a considerable run of the material would be required. As a result, the finished cabinet measured over 2 metres in length, with the sheer, flush expanse of its side panels and top surface providing the perfect showcase for Motivo Crocodile’s wow-factor aesthetic. The cabinet also called for the skills and mastery that can perhaps only come from a second-generation stonemason. Whilst the Motivo Crocodile surface is like no other, its highly realistic texture means not even the tiniest fabrication imperfection can be afforded. It was a complex project and Reeves and Taylor painstakingly ensured that every millimetre of the cabinet was crafted to exact standards. Corners and closures were precision tooled and finished and every possible detail was scrutinised before the cabinet was unveiled at the exhibition. “We are completely delighted to have had our work recognised by such respected industry awards. Caesarstone’s Motivo Crocodile is an amazing material to work with and we really enjoyed the challenge of designing and creating a piece of furniture that would show the surface off to best effect. However, a more eye-catching use of Crocodile would be hard to contemplate. The cabinet achieved its objective of giving Caesarstone’s 100% Design exhibition stand a head-turning focal point and was a triumphant mastery of a stunning, yet demanding material. For more information and to find out the rest of the winners of the 2013 Designer Kitchen & Bathroom Awards please visit the Designer Kitchen & Bathroom website.